The African Methodist Episcopal Church (AME Church) is a Christian denomination founded by Bishop Richard Allen in Philadelphia, Pennsylvania, in 1816. The Richard Allen (center), the founder of the African Methodist Episcopal denomination, is depicted with other bishops in an 1876 lithograph. Established in Pennsylvania in 1816, the AME Church arrived in Georgia at the close of the Civil War, as missionaries from the denomination entered the state with Union troops. Recent estimates of membership figures in the United States range from 2.5 million to more than 3 million. 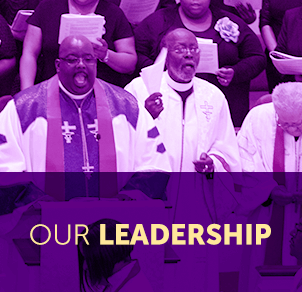 Most members are of African descent, although the church does not limit membership by race. The denomination's theological orientation is Methodist, while its organizational structure is Episcopal, meaning that it is primarily governed by elected bishops. The bishopric is appointed by the vote of the General Conference, which meets every four years. The AME Church, whose official motto is "God Our Father, Christ Our Redeemer, Man Our Brother," places a strong emphasis on social service. As such, the denomination folds its primary mission of preaching and religious education into a secondary mission of service to the homeless, the imprisoned, the poor, and other needy persons. Georgia is part of the sixth Episcopal district of the AME Church, and its current bishop is the Reverend Reginald Jackson. There are more than 500 AME churches in Georgia, and the greatest concentration is in Atlanta, which has about 36 congregations. Columbus and Savannah each have about 12. The AME Church did not make headway in Georgia until the closing months of the Civil War (1861-65). Missionaries from the denomination often followed Union troops into occupied parts of the collapsing Confederacy, adding numerous ex-slaves to their membership rolls. Henry McNeal Turner, the state's first AME bishop, played a vital role in organizing new churches during the Reconstruction era. Turner Chapel in Marietta was built and named in his honor in 1891 by the descendants of one of his first congregations. In 1973 the chapel was relocated to its current site, on Lawrence Street. 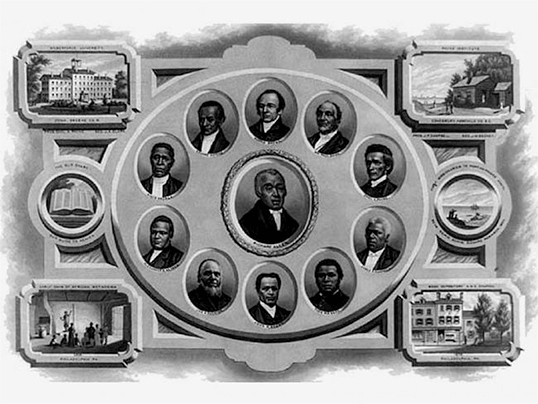 After reconstruction, AME congregations grew in number and importance. In 1881 the denomination founded Morris Brown College in Atlanta. Along with programs in home economics, education, and commerce, the school had a theology department for the training of ministers. In 1913 the college became a university and expanded its reach through branch institutions, but financial difficulties forced the branches to close in 1929. The school's original name, Morris Brown College, was reinstated at that time. During the civil rights movement, AME churches sometimes served as organizational centers for black leaders. For instance, W. W. Law led mass meetings at St. Philip AME Church in Savannah. In recent years AME churches in Georgia have sustained their social vision by maintaining emergency food banks and homeless shelters, in addition to providing other social services for local communities.